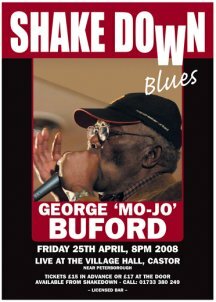 George 'Mo-Jo' BufordGeorge Buford was born into a god fearing musical family in rural Hernado, Miss; on the 10th November 1929. His grandfather was a preacher and his father and one of his uncles were harmonica players. His musical journey began in church when he joined the M&O Gospel singers who sang regularly at the nearby Union Hill and Pleasant Hill Baptist Churches - presumably pastured by his grandfather. George had another Uncle, Walter Buford, who owned a forty acre farm close to Memphis and he would often stay and help out on the farm. At the end of each week�s hard toil his uncle would drive into town and relax in the juke joints of Beale Street. When George grew older Walter began to take him on his forays into Memphis and one night he heard the blasting sound of Louis Jordan on the juke box and was immediately captivated by the exciting world of R&B. In 1944 his family left Hernando for the good life in Memphis and George married Rosa Lee, sired two children, pretended to be older, and got a job as a dustman. Four years later B.B. King had his Memphis radio show and the local blues scene began to crank up. Joe Hill Louis, Sonny Boy Williamson and Howlin� Wolf were hot and by the time Muddy and Little Walter shouted �All Aboard� George was in the store, buying his first harmonica, and dreaming of the big time. He wandered over to radio WDIA and became B.B.�s chauffeur driving him to gigs and soaking up the atmosphere. whenever the man himself was on tour. In 1962 he replaced James Cotton in the Muddy Waters (Senior) Band whilst also working as Little Jnr Buford when Muddy�s band was on the road. By then he had become very proficient on harp and his version of �Mojo Working� rocked the socks off his audiences to the extent that they began to call him �Mojo�. that year produced the fantastic �Deep Sea Diver� for Garret. All the Minneapolis recordings are highly sought after collector items and well worth searching out. 1971/72 was his last stint with Muddy and it was during their tour of the UK that I met him for the first time obtaining his autograph as Mo-Jo Buford! throughout the States and Europe ever since.